Clarified butter is milk fat rendered from butter to separate the milk solids and water from the butterfat. Typically, it is produced by melting butter and allowing the components to separate by density. The water evaporates, some solids float to the surface and are skimmed off, and the remainder of the milk solids sink to the bottom and are left behind when the butterfat (which would then be on top) is poured off. This butterfat is the clarified butter. Clarified butter has a higher smoke point (252 °C or 486 °F) than regular butter (163–190 °C or 325–374 °F), and is therefore preferred in some cooking applications, such as sautéing. Clarified butter also has a much longer shelf life than fresh butter. It has negligible amounts of lactose and casein and is, therefore, acceptable to most who have a lactose intolerance or milk allergy. In South Asian cuisine and Arab cuisine, ghee is made by cooking clarified butter longer during the separation process in order to caramelize the milk solids, resulting in a nutty flavor when they are filtered out. 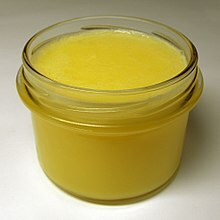 Ghee, a class of clarified butter that originated from the Indian subcontinent. Manteiga-da-terra, a Brazilian clarified butter product. Niter kibbeh, a seasoned, clarified butter used in Ethiopian cuisine. 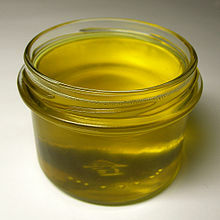 Smen, a salted, fermented clarified butter, widely used in North African and Middle Eastern cuisines. ^ "Clarified butter - Glossary - How to cook". BBC Good Food. Retrieved 2010-06-07. ^ Iyer, Raghavan (2008). 660 Curries, p. 21. New York: Workman Publishing. ISBN 978-0-7611-3787-0. ^ Jaffrey, Madhur (1982). Madhur Jaffrey’s Indian Cooking, p. 211. London: BBC Books. ISBN 0-8120-6548-4. ^ Sahni, Julie (1998). Julie Sahni’s Introduction to Indian Cooking, p. 217 under “usli ghee.” Berkeley: Ten Speed Press. ISBN 0-89815-976-8.